When Alexander Fleming discovered penicillin by chance in 1928, he speculated already that penicillin-resistant bacteria may come up. Now, in 2018, antibiotic-resistant bacteria are a major problem worldwide. In Germany, about 8000 patients die each year, because the pathogenic bacterium causing the infection is resistant against all known antibiotics and in the US about 90 000 people do not survive the infection. Besides antibiotic-resistant bacteria also antibiotic tolerant bacteria have been described. These type bacteria have been detected in 1944 by chance and were designated as persister cells. Later, it was shown that these cells stop growth because of the absence of any metabolic activity. Besides dealing with these two types of bacteria, I will report on several methods how can try to kill these bacteria. Wolfgang Schumann has completed his Ph.D. at the age of 27 years from the Mainz University and did postdoctoral studies at the Universities of Goettingen and Konstanz. 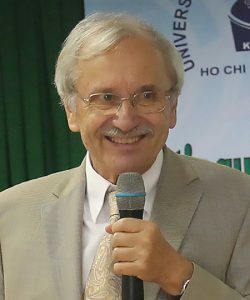 Since 1986, he is Professor at the University of Bayreuth and since October 2013 Distinguished Professor of the VNUHCM-University of Science, Ho Chi Minh City, Vietnam. He has published more than 150 papers in reputed journals related bacterial genetics, gene expression, and function. In addition, he has been serving as an editorial board member of two scientific journals.